A honeybee gorging on a green gage plum. Honeybees are everyone's favorite. After all, they pollinate our crops, make wax and honey, their language is a dance and they are the perfect model of a socialist society. They toil tirelessly gathering nectar and pollen, cleaning and building their home, and tending to the needs of the queen, who in turn produces eggs which replenish the ranks of the working class when they grow old. She maintains order and regulates things through pheromones. Each and every worker is willing to die in defense of the colony. It is true that their stinger is barbed, making it difficult to remove. The worker stings and then tears the apparatus from her abdomen, dooming her and allowing it to continue pumping venom into her enemy. There is a darker side to them, though. The queen ascends to power by murdering her competitors. A worker's retirement plan is simple: Die. When males have fulfilled their one purpose, they are either killed or forced from the hive and allowed to die. 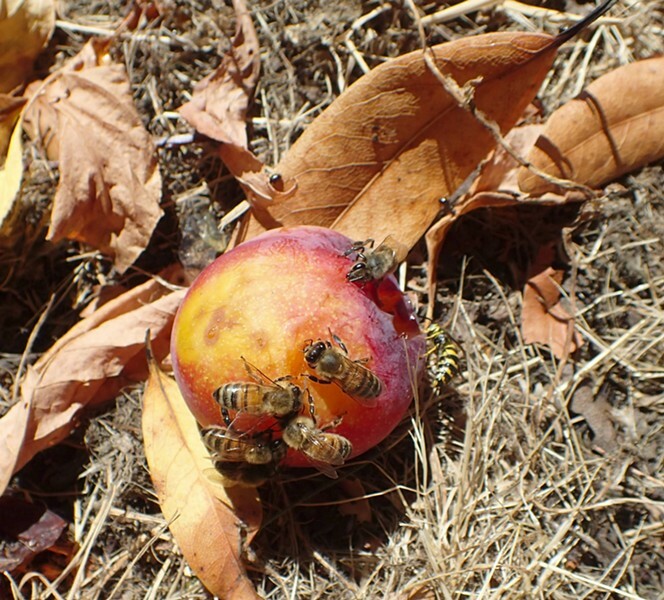 Honeybees sharing fruit with a yellow jacket. Recently I found yet another less than laudatory behavior. They eat my green gage plums. It has gotten so bad that I can't allow them to ripen on the tree. 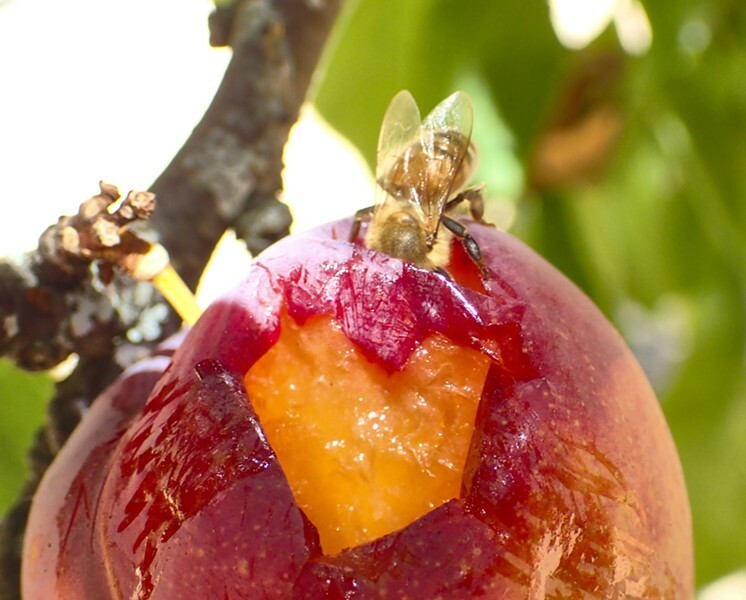 Honeybees pick the ripe ones and, starting at the top, eat the sweet parts, leaving a wound that rots. They are not shy about scavenging on the ground like their cousins the yellow jackets and even some butterflies. 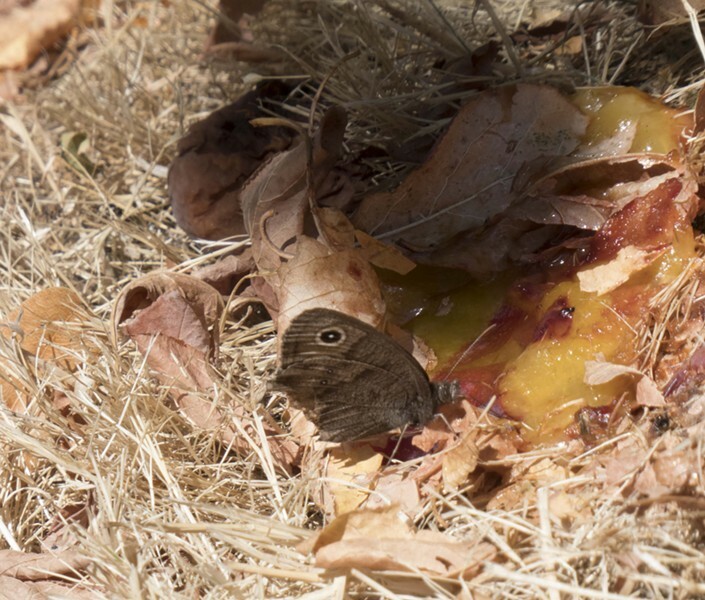 One of the wood nymph/satyr butterflies dines on rotting fruit. On another topic altogether, I've been seeing quite a few common green darner dragonflies down at the river and in my backyard. 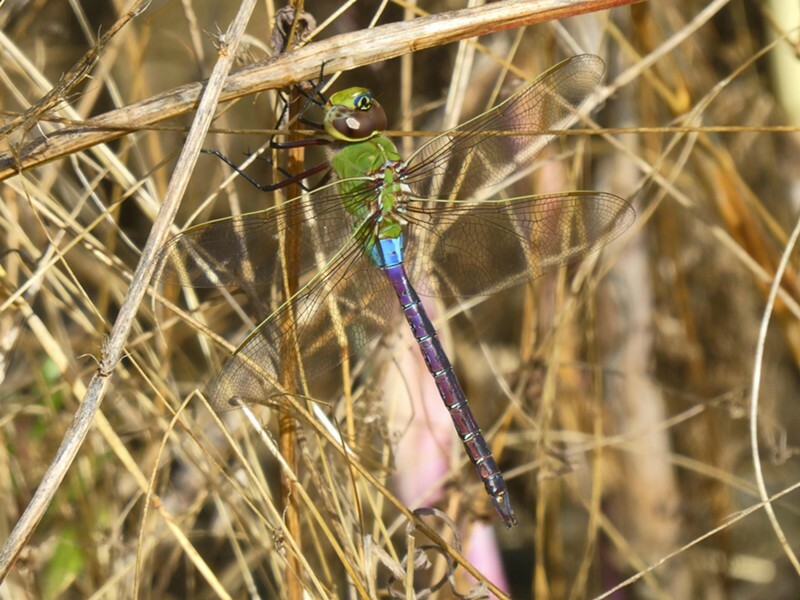 This large green, blue and maroon dragonfly is a well known migratory species. Annually stopping here on their way from the north, some making it all the way south into Mexico. This species also exists in Asia. A common green darner (Anax junius) rests on its journey.